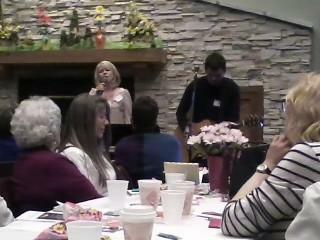 Spring Hills Baptist Church of Granville, OH recently held a Women’s Breakfast, welcoming warmer spring weather (yay! ), ladies of all ages from the church and other guests. Tables dotted with fresh daisy-filled tin vases of colorful greens and blues brightened the festivity and a rainbow of chocolates, candies and table favors were generously sprinkled within easy reach. After a brief welcome and prayer, we were treated to a marvelous breakfast spread of sizzling bacon, hotcakes, and other goodies including a flavored coffee and juice bar, provided by the local restaurant, Allison’s. Delicious! Mmmm…delicious breakfast and great conversations! The on-going theme at Spring Hill is to minister God’s truth to the generations. 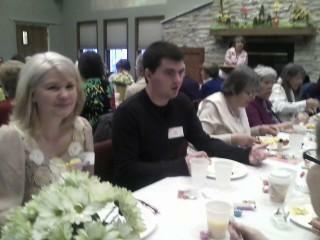 “Generations” was the theme of the Saturday Women’s Breakfast as well. Founding matriarch of the church, Mrs. Cathy Pound was invited to be the featured speaker. Before she began her meaningful talk which included a look at how the generations have evolved over the years from the turn of the century to 2015, and how we can be effective witnesses for Christ through his word and prayer in this current time, my son Zachary (the token male, lol) and I shared four songs leading into the theme of the day. We saw many dear friends, new and old that we consider extended “family” sitting before us as we ministered through the spoken word and song. Our selections included: “10,000 Reasons”, “Word of God Speak”, a new song written especially for this event entitled “To the Generations” and “None But Jesus”. Zac accompanied us on his guitar and I played a little piano as well. Everyone joined in the singing. In the coming days, songs such as these will be released on the Blog, in the hopes that you, readers, will be greatly encouraged. Today I wanted to share the words of “To the Generations”, inspired by that beautiful day. To us, being back with our old friends and family was indeed a taste of heaven. The room was packed with fellow believers in Christ Jesus, the living Son of God and together, we worshiped Him in the presence of His Holiness. I, personally, was thanking God for the sacrifice and leadership of this church in our family over the years. « Download Your Free Wendy James Christmas Song – an Indie Christmas Card to You and Your Family!